Welcome to the May 2014 issue of Northern Connection Magazine. his is an exciting issue as we feature local women making a difference in our community! It is such an inspiration to hear the stories of these successful women in our area that have started their own businesses and/or have strived in their career. Make sure to let us know about the successful women in your life and their stories! 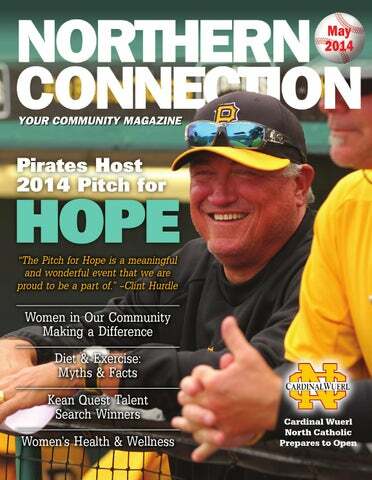 The cover story features the 2014 Pitch for Hope hosted by our very own Pittsburgh Pirates to benefit the Glimmer of Hope Foundation. The Glimmer of Hope Foundation was started by another inspirational woman in the area that is continuously making a difference in the world of cancer research, Diana Napper. Read more about the upcoming event and all that The Glimmer of Hope Foundation does to support breast cancer research. Northern Connection’s education section has been featuring an article on Innovations in the Classroom and Summer Camps. This is a great way to learn about the lengths that your community schools have been taking to teach kids about the ever growing and fast-paced world of innovations and the sciences. Make sure to continue the conversation with our editor Marianne Reid Anderson on her blog: ContinuingTheConversation.blogspot.com. She starts her conversation every month with a hot topic that is bound to spark conversation and this month is no different. Happy Mother’s Day and remember to hang your American Flag with pride and remember those who have fallen on Memorial Day. Thank you to all of those that have served and continue to serve and to their families that support them. Coming in the July NC... Northern Connection Magazine’s Annual Physicians & Healthcare Professionals Guide Call to reserve your ad space by May 16th! Northern Connection is published twelve times a year by Swanson Publishing Co., Inc. (P.O. Box 722, Wexford, PA 15090-0722, 724-940-2444) and is distributed free of charge to the northern suburbs of Pittsburgh. Subscription can be purchased from the publisher at $25 for one year. 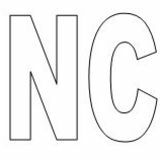 The mission of the Swanson Publishing Co., Inc. is to connect the northern suburbs of Pittsburgh by publishing the area’s finest community publication, Northern Connection. The publication is dedicated to the people, communities, educational, religious, travel, and recreational needs of the area. The contents of Northern Connection magazine may not be reproduced or copied in whole or in part without written permission from the publisher. Northern Connection magazine reserves the right to refuse editorial or advertisements that do not meet the standards of this publication. Movers & Shakers The Sisters of Divine Providence have hired Susan H. Rohm as the congregation’s new director of Mission Advancement. Kelly Harris of the Cranberry Chapter of Professional Referral Exchange was voted the Gold Award Winner in the category of Photographer by the readers of the Trib Total Media in the North section of Pittsburgh. National Volunteer Week was held Apr. 6-12, the Dept. of Veterans Affairs (VA) took advantage of the opportunity to thank more than 79,000 citizen volunteers who gave back to Veterans every day at local VA medical facilities. The First Lego League Western PA Championships were held Feb. 22, at Carnegie Robotics in Lawrenceville. The winning team from Western PA was Team 90: Not the Droids You Are Looking For. The team won with a robot named “Millennium Falcon.” Team members were: Arjan Guglani, Nick Faber, Arvind Seshan and Sanjay Seshan. The board of directors of North Hills Community Outreach is pleased to announce the hiring of the organization’s new executive director, Sharon Wolf. Genesis of Pittsburgh purchased 550 California Ave, formerly the Francks Pharmacy in Avalon from Ron and Shirley Francks. Renovations are underway with expected completion in July. Gateway to Equity Award. The event was held Mar. 29 at La Roche College. On Apr. 17, the North United FC U14 boys’ soccer team hosted “The Steel City International Cup” against JFC 09 Mondorf-Rheidt, a youth soccer club from Germany at J.C. Stone Field in North Park. The North United U14 premier team from Pittsburgh was chosen because of its reputation as the top team in its age group in PA-West, as well as, being a past Pennsylvania State Champion. The Blackwood Theatre Organ Society announced that they’ve awarded six scholarships this year to Pennsylvania high school seniors pursuing a college degree in instrumental music performance. The winners are: Bethany Lueers (Hampton High School), Matthew Ruwe (Seneca Valley), Eli Naragon (Winchester Thurston), Inori Sakai (The Ellis School), Jonah Trout (Canonsburg) and Jeremy Katz (Lower Merion High School). Pittsburgh Fringe Festival announce that their organization is a recipient of a 2014 Sprout Award. Church Rd. in Wexford, is having its Grand Opening Ceremony on May 17th, with a ribbon cutting at 3pm. The studio is family-owned and operated, and offers a wide variety of art mediums for kids and adults such as pottery, painting, sewing, ceramics and more. For more info on Summer Camps, workshops, birthday parties, etc. call 724-719-2181 or visit www. theartplacestudio.com. Keep those fingers crossed! Can the Pirates not only repeat the great season they had last year…or better yet…surpass it?? That’s what most Pittsburghers are hoping they can do. And why not? The roster is very strong with players like hometown hero, Neil Walker, Andrew McCutcheon, Pedro Alvarez, and Gerrit Cole, to name a few. In addition, last year’s Manager of the Year, Clint Hurdle, is still at the helm and looking forward to a very productive season. To many, this team is destined to do well. That is the HOPE! but also for the players and coaches who helped to make this day so special. This year, women who want to support the cause, but don’t want the field experience, can arrive post clinic and stay for brunch and the game. For that Guest group, the tickets cost $50 and $65 for those who participate in the entire event. For more information about Pitch for Hope that will be held on May 25 starting at 7:30 am at PNC Park, visit pirates.com/ pitchforhope or Angela.Criscella@Pirates. com. A Glimmer of Hope Foundation is gaining more recognition in the area as evidenced by the increase in the number of events that are planned for the summer and fall. On June 7, the Treesdale Women’s Golf Organization will host the third annual Par-Tee for Hope at the Treesdale Golf and Country Club. Co-chairs of the event are Jocelyn Thompson and Diane Blakeney. Monies raised at this golf outing will help to purchase specialized equipment that will be used by research staff at local hospitals. Then on August 22, Eileen Early and her committee are planning The First Annual Dimond Golf Outing that will be held at North Park Golf Course. Early has a relative who was diagnosed with breast cancer, and she is determined to do her part to help find a cure for this disease. For more information about this golf outing, please contact Anne at northparkglimmerofhope@gmail.com. On June 13, the Meadows Casino and Racetrack in Washington, PA will host a Ladies Night out that will include a fashion show. It will surely attract women who want to support A Glimmer of Hope and have a great night out with friends. Then on June 26, the Pirates will host a huge Zumba event outside of PNC Park. Zumba is a fitness program that combines aerobic and dance elements and is performed to Latin American music. It has become one of the most popular group exercise classes in clubs everywhere! For more information about A Glimmer of Hope Foundation visit our website at www. symbolofthecure.com or call 1-800-454-6746.
happens when you practice pitching, kicking, or swinging your golf club over and over •	Imbalanced muscle structure from training more to one side than the other There is no pill or exercise to correct the abnormal alignment. Only the adjustment does that. Studies have shown that when athletes are adjusted they have less injuries, probably due to better reaction times, and faster rates of healing. Are you looking for a diet to transform your life (or has a transformation already happened)? by download or as a complete package shipped to you by mail. How about Transformation through Liberation! F Jaclyn Herring, PhD is a licensed psychologist, practicing at the Psychological Cooperative at Malec, Herring& Krause in Mars. She is also the President of Diet Liberation, Inc, a company devoted to helping individuals make peace with food, their weight and bodies. She can be reached at 724-772-4949 or at www.dietliberationcourse.com. She will be speaking about this course at the Where to Turn Resource Fair on May 13 at the David Lawrence Convention Center. Construction is almost complete on the new Cardinal Wuerl North Catholic High School as the school, staff and administration ready themselves to welcome its first students in the fall. The school is a 185,000-square-foot complex situated on 70 acres atop a scenic hill on the north side of Route 228 near Cranberry’s border with Seven Fields. It is located near several highways making it an ideal location for those traveling from any direction. s part of the preparation for the school opening, the Rev. Charles Bober, the pastor of Saint Kilian parish, was named as president of the new school. Fr. Bober said, “I can’t wait to get the school up and running. It’s very exciting because it’s a major undertaking by the diocese. The diocese looking north for its latest high school provides a great opportunity to expand, a great opportunity for Catholic education.” When asked about his future plans for Cardinal Wuerl North Catholic, Fr. Bober said “The mission of Cardinal Wuerl North Catholic is directed toward the formation of Christ-centered young adults who are leaders in their communities, known by their intellectual, practical, ethical and human skills. Providing academic excellence in the context of Gospel values is at the core of what we do. Continuing the mission of the school is the foundation of our plans. As with any family moving into a new home, we are all aware of so many tasks that lie ahead as we live out our mission in a new location.” In addition to his duties at the new high school, Fr. Bober will remain as pastor of St. Kilian Parish in Cranberry. Chrzanowski, Zach DeDionisio, Mitch Weaver, Brendan Kennelty, Aaron Jackson, Chrissy Otteni, Becca Danik and Adam Johanknecht. Five Seneca Valley students earned honors at the Pittsburgh Regional Science and Engineering Fair at Heinz Field. They are: Robert Kunkel, Andrew Lingenfelter, Brock Gresock, Julia Kooser and Karina Latsko. Three students from the Pittsburgh Northern Homeschool Enrichment Co-op in McCandless were honored for their work in essay contest from the Daughters of the American Revolution. Mitchell Groves and Emma Cubarney were the Kushkushkee Trail Chapter winners. Melina Stratigos won not only a chapter award, but also the state of Pennsylvania award. She will be honored in Washington, D.C. in June. Melina’s essay has won the Eastern Division of the Daughters of the American Revolution which consists of fourteen states plus Pennsylvania. Her entry is now being judged in Nationals. Six Seneca Valley students performed at the Pennsylvania Music Educator Association (PMEA) AllState Choir. They are: Josh Baktay, Lance Hahn, David Osorno, Ellie Lahm, Lauren Ottaviani and Hayley Hoss. Seneca Valley choral students participated in a musical performance assessment and clinic on Apr. 3 with several accomplished musicians from our area. Guest judges were Dr. Kenneth H. Phillips, Dr.Christopher Kiver and Dr. Ryan Beeken. Toshiba/National Science Teachers Association has named four fifth grade gifted students from Haine Middle School as honorable mention winners in the national 2014 ExploraVision Project Competition. The team consisted of Marc Amaldo, Harry Foss, Ari Bilger and Jose Ordonez. tive branch proceedings, how a bill becomes a law and the responsibilities of the members of Congress. North Allegheny The North Allegheny School District had three national winners in the Scholastic Art & Writing Awards. They are: Anna Reed, Jake Hervoyavich and Leonardo Lupidi. North Allegheny High School Speech and Debate Team finished among the top 16 high school teams in the world after participating in the International Public Policy Forum (IPPF). NA competed against students from 28 countries and 37 U.S. states to achieve their final spot as one of the ‘Sweet 16.” North Allegheny’s DECA chapter won honors at the State Career Development Conference. Six students won top awards – Emmie Bish, Abbey Kirkendoll, David Bursic, Tyler Saundry, Alexis Provenzano and Katie Franc. Medallions were awarded to: Zach Hughes, Tyler Saundry, Jake Neugebauer, Alexis Provenzano, Kelly Tagliaferre and Katie Franc. Nineteen North Allegheny students have been recognized as All-Americans by the National Speech & Debate Association. They are: Kayla Badamo, Surabhi Beriwal, Drew Bjorklund, Chris Chang, Marisa DelSignore, Erica Fan, Jason Hu, Maria LaBella, Natalie Morrissey, Brandon Raymond, Anisha Reddy, Sarah Ricci, Medha Sharma, Annie Sippel, Pragna Sutrave, Wesley Swanson, Michael Tai, Hemanth Venkatesh and Catherine Zhang. from pony beads and Rainbow Loom bands. To date, the students have raised $700 for St. Jude Children’s Research Hospital. North Allegheny students Charles Ross and Emma Barnes have been recognized in the Pennsylvania State University Essay Contest for High School writers. Isley Smith, a junior at North Allegheny has won First Place in Category G for Grades 10-12, the Log House Award for Traditional Verse, in the Ligonier Valley Writers’ 23rd annual student poetry contest. A team of Marshall Middle School students won First Place in the regional tournament, and advanced to the U.S. Department of Energy’s National Science Bowl competition in Washington, D.C. Team members are: Will Taft, Owen Chase, Joe Shin, Mason Blackburn and Jianfeng Chu. Marshall Middle School eighth grader Will Taft and Ingomar Elementary fourth grader Owen Prem competed in the 2014 state level of the National Geographic Bee. A team of students from Marshall Middle School earned First Place in the Fairchild Challenge at Phipps, Middle School Challenge 4. Saint Bonaventure Lady Bobcats JV Class A Basketball Team captured the school’s first ever JV Class A Diocesan Basketball Championship at Oakland Catholic High School. Ryan Smith, an eighth grader at St. Bonaventure School qualified to compete in the 2014 Pennsylvania State Geographic Bee. Saint Sebastian School Forensics won third place honors at the Southwestern Pennsylvania Forensic League Finals. They also placed fifth in the Diocese of Pittsburgh for the Forensic competition season. Team members were: Mary Doerfler, Alexis Moskala, Emma Sennott, Jack Wells, Alecia Spagnolo, Christina Koman, Domenic Melchiorre, Vincent Melechiorre, Claire Skirtich, Nicole Costa, Nicholas Kasper, Lisa MacQueen, Kristen Markabawl and Ryan Petrunia. William Lloyd, a history teacher from Central Catholic High School and Matthew Sudnik, director of the Baginski Scholars Program have been selected as National Endowment for the Humanities (NEH) Summer Scholars. Providence Heights Alpha School recently participated in the “Jump Rope for Heart” fundraiser. This year the school raised over $5,900 for the American Heart Association. Additionally, first grader Anna Murray won an IPad Air for her collect donations. Sixteen Providence Heights Alpha School seventh and eighth grade students participated in the Pittsburgh Regional Science and Engineering Fair. Several Alpha students earned accolades. They are: Emily Meinert, Hannah Schrupansky, Joe Schurer, Anna Wisniewski and Jacob Lowry. as winners of National Achievement $2,500 Scholarships. Shady Side Academy junior Julian Schwartz auditioned for and was accepted to the British American Drama Academy’s Midsummer Conservatory Programs to study Shakespearean acting this summer. Shady Side Academy sophomore Zachary Kosbie and Fox Chapel Area High School sophomore Konrad Urban were both winners of the National Society of the Colonial Dames of America 2014 Essay Contest. They won an allexpenses paid trip to a week-long congressional seminar in Washington, D.C.
Sewickley Academy On Apr. 4, Sewickley Academy engaged in its third annual Day of Service, a full school day committed to service projects both on and off campus, demonstrating Sewickley Academy’s commitment to the service of the greater good. Thanks to a generous grant from Sewickley Academy’s Home and School Association, members of Sewickley Academy’s faculty were issued new iPad Airs, device that will allow their teachers to explore ways that mobile technology can enhance their teaching and learning the classroom and beyond. La Roche College La Roche College inducted 12 accomplished graduates into its Distinguished Alumni Circle, recognizing them for outstanding leadership and extraordinary professional success. CCAC Community College of Allegheny County student Shawn Hinnebusch has been named a 2014 Coca-Cola Community College Academic Team Bronze Scholar. Saint Vincent College The Fred Rogers Scholars and Incubator 143 from Saint Vincent College collected gently used sweaters for those in need. NerdScholar has named Saint Vincent College as among the best values in Pennsylvania higher education. Officials of Baierl Subaru and Subaru of America presented a check for $6,603 to the Fred Rogers Center for Early Learning and Children’s Media at Saint Vincent College. Seniors in the Alex G. McKenna School of Business, Economics and Government at Saint Vincent College scored in the top 17% overall among more than 662 college and university schools of business in the United States on a national test administered by Educational Testing Service (ETS). Five Saint Vincent College seniors have been named finalists for the 40th annual Presidentâ&#x20AC;&#x2122;s Award. They are: Tanner Beal, Joshua Gongaware, Rebecca McGrail, Emily Rosati and Natalie Woodruff. Elise Glenn was welcomed to the Saint Vincent College as the director of the trial moot court program by Dr. Bruce Antkowiak and Dr. Gary M. Quinlivan of Saint Vincent College. Dr. Patrick D. Gallagher, a physicist and former U.S. Commerce official became the 18th chancellor of the University of Pittsburgh on Aug. 1. He will address the graduates at Saint Vincent College Commencement on May 10. Vincentian Academy Vincentian Academy just finished their amazing production of Grease.Â Plus, over 90% of the entire student body participate in extra-curricular activities at Vincentian Academy. Seven Saint Vincent College seniors who plan to attend law school in the fall were recognized at the fourth annual Saint Vincent Law Society Send-Off Luncheon at the college on Apr. 9. They are: Tanner Beal, Joseph Carroll, Gretchen Panchik, Natalie Yanniruberto, Lila Eid, Peter Hronis and Felecia Watt. Saint Vincent College management professor Dr. Michael J. Urick, is the co-author of a chapter in a book, Extreme Leadership: Leaders, Teams and Situation Outside the Norm. husband Don and I will join the other members of our Vintage Radio Group to entertain the retirees of Duquesne University. Those are all fun things; but, there are some work things to do too. For instance, I have to clean and prepare our backyard gazebo to get rid of all the winter dirt that accumulates. But, I’ll be so glad that I did when I sit out there on my recliner and read a book in the hot summer weather. Look for it wherever you find Northern Connection CALL now to reserve your advertising space for Summer 2014! Happenings for Seniors Free Home Safety Inspection is available for seniors through the Open Your Heart to a Senior program. For info, call Cathy at (412) 307-0069 or clpschirer@nhco.org. Free Rides for Seniors, to grocery stores, doctor’s appts & more thru St. Margaret’s Foundation. Pick up & drop off seniors in the corridors from Sharpsburg to Blawnox & Rt. 28 to the Allegheny River. Sign up by calling, (412) 449-0151. Home Instead Senior Care® is offering a unique approach to help area families in Northwest Allegheny County manage the challenges of Alzheimer’s and other dementias. Free training is available for families at HelpForAlzheimersFamilies.com. Parkwood Suburban North Meals on Wheels provides home delivered meals to the elderly, homebound and disabled. Meals on Wheels services Hampton & southern Richland townships. Call (412) 486-7115. Open Your Heart to a Senior Volunteer Orientation, 6:30 p.m., May 20, Eat N’ Park (Pittsburgh Mills), 3005 Pittsburgh Mills Blvd., Tarentum. For info, call (412) 307-0071 or 2-1-1- or email allegheny@openyourhearttoasenior.org. Safety for Seniors will conduct FREE Home Safety Checks. For info, call Cathy, at (412) 307-0069 ext. 3313 or clpschirer@nhco.org. UPMC Senior Communities offers independent living & personal care. For details, call 1-800-324-5523. Senior Meetings Cranberry Senior Citizens Club for residents 55+ meets at 1 p.m., the 2nd Tues., of the month in the Cranberry Municipal Center. Call (724) 816-4977 for info and programs. Friendship Groups for Visually Impaired, Men’s Group meets every Weds. 1-3:15 p.m., Knitting & Crocheting Circle meets every Weds., 1-3:15 p.m., Monthly Meeting 2nd Thurs. of each month 1:15-3:15 p.m., The Lunch Bunch meets 4th Thurs. of every month 11 a.m.-1:30 p.m., The Talking Book Club meets 1st Mon. of each month 1-2:30 p.m. For info, call (724) 444-0064. Glenshaw AARP #3744 will meet 7 p.m., May 13, Elfinwild Presbyterian Church, 3200 Mt. Royal Blvd., Glenshaw. Mars AARP Chapter #3359 meets 2nd Wed. of every month, 1 p.m., Adams Township Municipal Building, 690 Valencia Rd., Mars. All Butler seniors are welcome. Cost $5 a year. Paramount Senior Living at Cranberry Alzheimer’s Affiliated Support Group meets the 1st Mon., of every month 6-8 p.m., and the last Fri., 1:30 p.m. Contact Pam, at (724) 779-5020. Perrymont AARP Chapter #2991, Northmont Church at the corner of Perrymont Rd. & Rte. 19 in the North Hills. Meetings held 11:30 a.m., every 3rd Thurs., of the month, Sept-May. A light lunch is served. Events - May 20, Rocky Gap Casino, MD; June 3-4, play “Moses” in Lancaster PA; Chapter picnic, June 19, North Park. All are welcome. Call(412) 389-2369. Primetimers, noon, first Thurs of the month, Christ Church Grove Farm, Ohio Twp. For info, call (412) 741-4900 or visit http://www.ccgf.org. Entertainment & Social Events	Banjo Club, 2 p.m., May 2, Sherwood Oaks. For details, call 1-800-642-2217 or www.sherwood-oaks.com. Cahal Dunne – Ireland’s Happy Man, 2:30 pm., May 14, Lighthouse Pointe; 2:30 p.m., May 15, Vanadium Woods Village, 2:30 p.m., May 16, Strabane Trails Village; 3 p.m., May 20, Seneca Hills Village; 2:30 p.m., May 21, Beatty Pointe Village. Visit UPMCSeniorCommunities.com. Collin Stover: Magician & Mentalist, 2:30 p.m., May 7, Beatty Point Village. To register, call (412) 374-9000. Dr. Knowledge: Fascinating Facts & Interesting Stories, 10:30 a.m., May 6, Hampton Fields Village, register at, (412) 492-8448, May 8, Lighthouse Pointe, register at, (412) 781-2707. Senior Citizens’ Prom, 7-10 p.m., May 2, North Allegheny Senior High School. To make a reservation, call (412) 3695445. Seminars & Courses AARP Smart Driver™ Course, 1-5 p.m., May 14 & 15, Sherwood Oaks. To register, call 1-800-642-2217 or www. sherwood-oaks.com. Antique Appraisal, 2:30 p.m., May 1, Strabane Trails Village, 317 Wellness Way, Washington, Pa. Free registration, call (724) 225-4100 or UPMCSeniorCommunities.com. Neil Diamond Performed by Chris Denem, 2:30 p.m., May 21, Hampton fields Village. Register at, (412) 492-8448. Fall Prevention, 3 p.m., May 8, Seneca Hills Village, Verona. Call (412) 793-1700. Saint Alexis Over 50 Trips & Events, May 12-15 - Travel to Louisville with AARP. Dinner Cruise, Churchill Downs and more. Contact Rose at (724) 728-2563 for information. i, everyone is happy to see the month of May. In our area, farmers and gardeners alike try to complete all of the seeding and planting by the end of the month working around May’s unpredictable weather. As a young boy living in the Wexford area, I noticed that we had a large abundance of farms. Being raised in the thirties, the farmers still had draft horses, and a team of horses did all of the plowing. They were all very hard-working people. Back then, almost everyone that I knew had a garden. As I young boy, I also remember that during the month of May, I was busy helping with the spring-cleaning. Also as a young boy, mom always set aside May to dedicate and honor the Virgin Mary. She had a small statue, and we had flowers around it the whole month of May. At one time, this month was considered bad luck to get married. There is an old saying that goes, “Marry in May and you’ll rue the day.” On to the positive side of May, let us not forget about our mothers this month. There are over 122 million phone calls made on Mother’s Day. To add to the statistics, over 2 million dollars are spent on flowers. Most folks living in the United States do not realize it but, the first day of May is designated “The International Workers’ Day.” This day is also known as “May Day.” The origins of this celebration are as American as baseball and apple pie. The roots of this commemoration stem from the pre-Christian holiday of Beltane, which is the celebration of the rebirth of fertility. rmed Forces Day pays tribute to men and women who serve in the United States armed forces. This observance is held annually on the third Saturday of May. It will be celebrated on May 17th this year. Armed Forces Day is part of Armed Forces Week, which begins on the second Saturday of May. Another celebration this month is Memorial Day, originally called Decoration Day, it is a day of remembrance for those who have died in our nation’s service. It is observed every year on the last Monday in May. Some military honors have recently been held in our area. The Community College of Allegheny County North Campus paid tribute to the Tuskegee Airmen from Pittsburgh who fought in World War II. The homage included surviving airmen and their families, as well as, relatives of those now deceased. The event featured a proclamation issued by Mayor Bill Peduto and a presentation of Quilts of Valor to the airmen and their descendants. p.m. , May 26, down Butler Street, in Lawrenceville to end at the cemetery for the 105th year in a row. •	V.F.W. Post 9199 and Post 785 American Legion in Shaler Township will conducted a Memorial Day Service at 11:30 a.m., May 26 in Mt. Royal Cemetery at the flagstaff. •	The Borough of Etna has its annual Memorial Day Parade which begins at 9:30 a.m., May 26, along Butler Street from Maplewood to Freeport, down Freeport and into Sharpsburg. Take time-out from your picnics and barbecues on May 26, and remember to and salute our fallen veterans. F We welcome brief biographies and photos of local servicemen and women from our community. If you know of someone you’d like to see featured in this column, please call (724) 940-2444 or mail the information to: Northern Connection Magazine, P.O. Box 722, Wexford, PA 15090-0722 or email northcon@ consolidated.net. Senior Happenings (Continued from page 31) free course, call (412) 748-6640. Lifestyle Choices That Promote Healthy Brain Aging, 11 a.m., May 20, Cumberland Woods Village, McCandless. Call (412) 635-8080 or visit, TheLegacyLineup.com. VA Benefits Seminar, 2:30 p.m., May 6, Vanadium Woods Village. Call (412) 221-2900. Volunteer Opportunities: North Hills Community Outreach’s Faith in Action program is seeking Senior Companion volunteers. For details, contact Nancy, at (412) 307-0069 or nljones@ nhco.org. Oasis Intergenerational Tutoring, help your child learn to read. If you’re 50 or older you’ll be trained. Tutor training sessions run 10:30 a.m.-3:30 p.m., at downtown Macy’s. For details, call John (412) 232-2021 or email jdspehar@oasisnet.org. Open Your Heart to a Senior, Snow Squad volunteers are needed, to shovel snow for seniors. For details, call (412) 307-0071 or 2-1-1, or visit www.oyhs.org or email allegheny@openyourhearttoasenior.org. Yard Work Help for Seniors, volunteers are needed in all neighborhoods of Allegheny County. To register as a volunteer with Open Your Heart to a Senior, call (412) 307-0071 or email allegheny@openyourhearttoasenior.org. P.A. ERBE & Associates Inc.
Happenings North Happenings Glade Run Foundation events: Highmark Walk, May 17, Heinz Field. Call (412) 452-4453 or www.gladerun.org. Hazardous Waste & Electronics Collections, May 3 & 17, Jun. 7 & 28, Jul. 12 & 26, Aug. 16 & 30, Sept. 13, Oct. 18 & Nov. 8, Butler County. Visit www.recyclebutler.us. Mobile Shredding Event, 10 a.m.1 p.m., May 17, Hampton High School parking lot, 2929 McCully Rd., Allison Park. Limit of two 13-gal. size bags. For info, call (412) 487-6605. North Hills Community Outreach’s Community Auto Program is looking for vehicle donations that will provide transportation for lowincome individuals. Call (724) 443-8300 or www.communityauto.org. North Hills Community Outreach Dinner Theatre Don’t Tell Mother, Dessert Theatre, June 11 & Dinner Theatre, June 12, at St. Paul’s United Methodist Church. Call Cheryl (412) 487-6316, Opt. 1, or www.nhco.org, or clenglish@nhco.org. North Hills Food Bank, 10 a.m.1:45 p.m. every Tues & Thurs, rear parking lot of Hiland Presbyterian Church, 845 Perry Highway. Call, (412) 366-7477 or www. northhillsfoodbank.com. Donations always welcome. The Rotary Club of Lawrenceville is accepting nominations for the “Donald R. Canfield Community Activity Award.” Deadline for nominations is May 10. Send nominations to luci.casile@ pnc.com. WorkAble offers free employment services to unemployed and underemployed people in Allegheny County. Orientations & workshops held in March. Call Harriet, (412) 408-3830 ext. 3219 or hzgibbs@nhco.org. Mondays Chisel and Chips Carvers of North Pittsburgh meetings, meets 6:30- 10 p.m., the 2nd Monday of every month, Parkwood United Presbyterian Church, 4289 Mt. Royal Blvd., Allison Park. For info, call (724) 940-0034. Greater Cranberry Barbershop Chorus, meets every Monday at 7 p.m., Mars Alliance Church, Rt. 228. Visit Bogmeisters.com. Greater Pittsburgh Civil War Round Table meets the 4th Monday of every month 7 p.m., (May 19), Hampton Township Community Center, 3101 McCully Rd., Allison Park. Call, Bob or Margie (724) 625-2329. Movie Matinee Mondays, 2 p.m. Mondays, Last Vegas, May 5; Captain Phillips, May 12; & Diana, May 19, The Legacy Theatre, 700 Cumberland Woods Drive, McCandless Twp. For info, (412) 6358080 or TheLegacyLineup.com. Tuesdays North Pittsburgh Mother of Multiples meeting, 7:30 p.m., 3rd Tues., of the month, North Hills Community Baptist Church, 7801 Thompson Run Rd. For info, visit www.facebook.com/NPMOMS. pre-register, call (412) 408-3830 or hzgibbs@ nhco.org. Country Knight Line Dancers host a line dance 7-10:30 p.m. every Wed., in St. Athanasius Hall, cost $5 per person. Call, Janine (412) 931-6971 or janine.beley@ gmail.com. Thursdays Cranberry Women’s Club, meets 7 p.m. the 2nd Thurs of the month, Cranberry Library Meeting Room. Contact Sandy, (724) 779-1854. Handicapable Square Dancing Lessons, Thurs., from May thru Oct., Dorseyville Alliance Church. Volunteers needed to assist. For details, call Marti or Gary (724) 443-2616. National Aviary Night, 5-9 p.m., 3rd Thurs., of the month. Half price admission, 21 and over. For details, (412) 258-9445. Friday Christy House in Sewickley, Friday luncheons, 11:30 a.m.-1:30 p.m., Frederick Ave., Sewickley. Homemade soups & specialty breads. Call (412) 741-5960. Visit The Needles Eye and Earthly Treasure. Visit ststephenschurch.net. Saturdays Saturday Singles Dance for ages 40+, 8 p.m.-midnight, May 10, “Anniversary Party,” free dance lesson 7:30 p.m., dance 8 p.m., May 24, “Free Speed Dating & Nacho Night, West View VFW, 386 Perry Hwy, West View. Call, (724) 316-5029 or www.dancetonight.weebly.com. Second Saturday Divorce Workshop for Women, 8:30 a.m.-12:30 p.m., May 10, Cooper Siegel Community Library, 403 Fox Chapel Rd. Preregister at, (724) 493-9695. Arts & Entertainment The Bronx Wanderers, 2:30 p.m. and 8 p.m., May 17, Kean Theatre, Gibsonia. For reservations, call (724) 882-5566 or www. thebronxwanderers.com. “Digital Hand” art exhibition runs thru May 25, at the Pittsburgh Cultural Trust, 709 Penn Gallery. For info, visit www. TrustArts.org. I Love You, You’re Perfect, Now Change, 7:30 p.m., May 3 & 10; 2 p.m., May 4 & 11, Cumberland Woods Village. For tickets, call 1-877-987-6487. JazzLive, 5-9 p.m., Tues., May 6, George Heid III; May 13, Dan Wasson; May 20, Nelson Harrison; May 27, Eric DeFade; Backstage Bar. Visit www. TrustArts.org/cabaret. JazzLive International Festival, June 20-22, Cultural District. For details, visit http://pittsburghjazzlive.com. International Children’s Theatre, May 14-18, Cultural District, downtown Pittsburgh. For details, (412) 4566666 or www.PghKids.org. Legacy Theatre: I Love You, You’re Perfect, Now Change, 7:30 p.m., May 3 & 10 & 11 a.m. & 2 p.m., May 4 & 11, Legacy Theatre. For tickets, 1-877-9876487 or TheLegacyLineup.com. Pittsburgh Concert Chorale presents: Big Band & Beyond, 7:30 p.m., May 3, Fox Chapel Presbyterian & 4 p.m., May 4, Ingomar United Methodist Church. For tickets, call (412) 635-7654 or http://www.pccsing.org/tickets/index.php. Psychic Panic Art Exhibition, May 16-June 29, Pittsburgh Cultural Trust’s Space Gallery, 812 Liberty Ave. For info, visit www.TrustArts.org. Health & Wellness Head & Neck Pain Seminar, 1 p.m., May 7, Club Julian, 101 Corbett Court. Sponsored by Passavant Hospital Foundation. Call (412) 366-1931. Lizzy’s Bikes, a Kiwanis Club of Mars community action program, provides free bikes to local needy children. Call (724) 7794364 or email LizzysBikes@yahoo.com. North Hills Community Outreach is participating in Highmark Walk for a Healthy Community on May 17 on the North Shore. Join their team & raise funds for NHCO’s Back-to-School program. Call, (412) 408-3830 or register at www. WalkforAHealthyCommunity.com. Save Your Shoulder, Surgical & Nonsurgical Treatment for Shoulder Pain, 6:30 p.m., May 20,CCAC North in McCandless. Sponsored by Passavant Hospital Foundation. To register for this free course, call (412) 369-3701. St. Margaret Foundation, 6-7:30 p.m., May 8, Skin Cancer: Spot & Stop It; May 22, Lumbar Spinal Stenosis: A Cause if Lower Back, Leg Pain, June 5, Vanishing Varicose Veins, Heart & Vascular Institute. For info, call (412) 7844022 or www.stmargaretfoundation.org. Counseling Professional Counseling, need someone to talk with but can’t afford it or lack health coverage. Call Anchorpoint Counseling Ministry, (412) 366-1300. Networking Cranberry Chapter of the Women’s Business Network meets 7:30 a.m., May 1 & 15, 2662 Rochester Rd., Cranberry Twp. Call Marcia, (724) 538-3059. Criders Corner Chapter of the Women’s Business Network meets noon, May 8 & 22, Cranberry Echo Restaurant, Rt. 228, Cranberry Twp. Call Annette, (724) 316-8005. Friday Morning “Coffee Club,” 8-9 a.m., Fridays, Butler County Chamber of Commerce. For details, call (724) 283-2222 or Jennifer@ButlerCountyChamber.com Meet-N-Move Networking Luncheon w/Ellwood City, Zelienople, Harmony & Beaver County Chambers of Commerce, 11 a.m.-1:30 p.m., May 13, Shakespeare’s at Old Stonewall. For info, call (724) 283-2222 or email Jennifer@ ButlerCountyChamber.com. North Hills Chapter of the Women’s Business Network meets 12:30 p.m., May 9 & 23, Atria’s Restaurant, 5517 William Flynn Hwy. Call Debbie, (724) 449-8368. North Hills Newcomers and Friends spring raffle, 10 a.m., May 13, Shannopin Country Club. Proceeds benefit Glade Run. For info, visit www. northhillsnewcomers.org or email NHNFmembership@gmail.com. Professional Referral Exchange (PRE) meets 7:15 a.m., Weds, Deck House, Rt. 19, Cranberry Twp. Call Ken, at (610) 4967600 or visit, www.prenetworking.net. Ross-West View Chapter of the Women’s Business Network meets, 7:30 a.m., May 8 & 22, Perry Perk Coffee Shop, 1012 Perry Hwy, Ross Twp. Call Donna, (724) 493-9695. Seven Fields Chapter of the Women’s Business Network meets, 8:15 a.m., May 1 & 15, Concordia Life Care Community, Rt. 228, Adams Ridge. Call Nina, (724) 772-1922. Toastmasters Cranberry High Noon Club, meets noon-1 p.m., every Mon., at the Cranberry Library, 2525 Rochester Rd., Suite 400. Guest & new members are welcome. Call Mary Jo, (412) 367-7710 or http://3331281.toastmastersclubs.org. Wexford Chapter of the Women’s Business Network meets, 8:00 a.m., May 13 & 27, Atria’s Restaurant, Rt. 19, Wexford. Call Denise, (412) 716-1322.
to & from their appts. Interested volunteers should call (412) 919-1100 or emailsharon. stalter@cancer.org. College’s 49th commencement ceremony on May 3. For info, visit laroche.edu/commencement. North Hills Community Outreach Orientation & Information Sessions, 10-11 a.m., May 8, NHCO in Allison Park. Register by calling Linda, (412) 408-3830 or lkrobins@nhco.org. Fairy Tales & Folklore Exhibit runs through June 6, McCarl Gallery at St. Vincent College. Admission is free & open to the public. For info, (724) 805-2569 or www. mccarlgallery.org. Tutoring Volunteers Needed, 1-3 hrs., per week w/homework & study skills. Call Sandy at Anchorpoint Ministries (412) 366-1300 x23. The First Step to Small Business Success, 9:30-11:30 a.m., May 14, Saint Vincent College. For details, call (724) 537-4572 or www.stvincent.edu/ sbdc. Volunteer Book Sorters Needed for Anchorpoint’s annual used book sale. For info, call Denise a (412) 3661300 x13. Volunteers are needed at the Repurposed Thrift Store in the Northway Mall. The store is accepting donations of any kind. They support Living in Liberty, a nonprofit who helps women rescued from human trafficking. To volunteer, call (412) 548-3755. Kennywood Day for North Allegheny, June 19. In-school ticket sales at all NA schools on May 15. For details, visit www.northallegheny.org/ athletics. Introduction to Catholic Liberal Arts will be offered June 15-20 at Saint Vincent College. For info, visit (724) 805-2844 or www.stvincent.edu/faithandreason. Saint Vincent College is offering graduate classes 6-10 p.m., Tues, May 20, 27 & Jun. 3, 10, 17, 24 & July 1, at Somerset Senior High School. For those works a Master of Science degree in curriculum and instruction or education. Call (724) 85-2933 or www.stvincent.edu/grduateprograms. call (412) 243-7535 ext.223 or email estimmel@power-recovery.com. Saint Vincent Summer Theatre, Heroes by Gerard Sibleyras, May 29-June 14; Boeing, Boeing, June 19-July 5; Jeeves in Bloom, July 10-26; A Grand Night for Singing, July 31-Aug. 17. For details, www.svst.org. Mary Kay Foundation Fundraiser, 11 a.m.-1:30 p.m., May 10, Pella Showroom off of Thorn Hill Ext. Funds research for cancers affecting women, and funds programs against domestic violence. Visit, www.marykayfoundation.org. Saint Vincent Summer Theatre Gala, 6:30 p.m., July 11, Robert S. Carey Student Center at St. Vincent College. For details, (724) 805-2901. Peace. Love. Run 13.1 Half Marathon & 5K Run/Walk, 7 a.m. (half marathon) & 7:45 a.m. (5K Run/Walk), June 22, North Park Boathouse. Sponsored by Catholic Hospice and Palliative Services. To register, call 1-866-933-6221. Veterans North Pittsburgh Quilts of Valor meets 7-9 p.m., 2nd Mon., of the month, Quilt Company, Middle Rd., Allison Park. Call (412) 487-9532 or www.qovf.org. La Roche College & the University of Pittsburgh have signed an articulation agreement that will allow Engineering students to earn a degree from both institutions. To learn more, call (412) 536-1272 or admissions@laroche.edu. Veterans Discover HOPE HereCareer, 3rd Wed., 6:30-8:45 p.m., Cranberry Twp., Municipal Building, 2525 Rochester Rd., Cranberry Twp. Free. Call (724) 7798323, discoverhopehere@gmail.com or www. discoverhopehere.com. Pittsburgh Fringe Festival, 6:30 p.m., May 6, Cathedral of Learning, University of Pittsburgh. For info, visit www.pghfringe. org. Veteran’s Fitness Classes 5 Days a week, 4:30-5:30 p.m., VA Butler Healthcare Auditorium (bldg. 1), 325 New Castle Rd., Butler. For details, visit www.prevention.va.gov/B_Physically_ Active.asp. Workshops All the Hats Owners & Managers Wear workshop, 11:30 a.m., May 28. Sponsored by the Butler County Chamber of Commerce. Call (724) 283-2222 or email Stan@ ButlerCountyChamber.com. Smart Investments Offers Free Money Management Workshops for Women, 10 a.m., May 19, NHCO North Boroughs; 2 p.m., May 21, NHCO Millvale & 1 p.m., May 23, NHCO Allison Park. To register, call NeighborWorks, at (412) 281-9773. Conventions, Festivals, & Sales Children’s Festival, May 14-18, Cultural District, downtown. For details, visit www.pghkids.org. Come Together concert, 7:30 p.m., May 25, New Community Church, Wexford. Benefits Urban Impact in Pittsburgh. Tickets can be purchased at, www.NCCinWexford.org. Pittsburgh Foundation Day of Giving, 6 a.m.-midnight, May 6. Sponsored by the Butler County Symphony. For details, visit www.pittsburghgives.org. Pittsburgh Walk Now for Autism Speaks, (8 a.m. registration), 10 a.m., walk, June 14, Heinz Field. Visit www.walknowforautismspeaks.org/pittsburgh to register your team. For info, call (412) 367-4571. Camps Imagine & Build with God Vacation Bible Camp, 9:30 a.m.12:45 p.m., July 28-Aug. 1, Glenshaw & Parkwood Presbyterian Churches, 4289 Mt. Royal Blvd., Allison Park. Register at http://2014cokesburyvbs.com/GPVBS. SonQuest Treasure Island Vacation Bible Camp, 9 a.m.-noon, June 23-27, Saint Alexis Parish, 10090 Old Perry Hwy., Wexford. For info, call (724) 9354343 or www.stalexis.org. Spring & Summer Events Antique and Classic Car Show, 10 a.m.-4 p.m., June 1, Mars Area Senior High School, Rte., Mars. Sponsored by the North Hills Historic Auto Club. For info, call Joe at (412) 443-0359 or joeandkath@ verizon.net. Avalon Apple Blossom Festival, 8:30 a.m.-4:30 p.m., May 10, 638 California Ave. Pancake breakfast, crafters, car cruise, Chinese auction. Sponsored by Trinity Lutheran Church & Avalon Boroughs. For info, (412) 761-4010. Butler County History Day, 10 a.m.-4 p.m., May 17, tours of the Harmony Museum, Lancaster Twp. History Center, Passavant & Buhl houses in Zelie. For info, (724) 283-8116, www.butlerhistory.com. Common Bird of Western Pennsylvania, 11 a.m., May 6, Cumberland Woods Village, McCandless. For info, call (412) 635-8080 or TheLegacyLineup. com. Mount Washington Home Tour, 10 a.m.-4 p.m., May 10 (cocktail party May 9). Sponsored by the Junior League. For info, visit www.jlpgh.org. National Aviary: Penguin Painting, 3 p.m., May 11; National Aviary Night, 5 p.m., May 15; Eagles of the World Weekend, 11 a.m., May 17; Bald Eagle Tour, 9 a.m., May 17; Photo Safari Saturday, 9 a.m., May 17; Brunch featuring Atria’s, seating 10:30 a.m. & 12:30 p.m., May 11, June 15, July 6, Aug. 10 & Sept. 21, required reservations (412) 258-9445. “Quilt in a Day” program, 10 a.m.-noon, May 27, Harmony Museum’s Stewart Hall. For info, (724) 452-7341 or www.harmonymuseum.org. Spring Craft Fair, 9 a.m.-2 p.m., May 3, East Union Presbyterian Church, 292 East Union Road, Cheswick. Hand-crafted items & Chinese auction. Free admission. Call Mary Lynn, at (412) 767-5750.
a.m.) at the Cranberry Municipal Building. Self-guided tour. For info, visit www.southernbutlercountygardenclub.org. Golf & Sporting Events Butler County Chamber Golf Outing, noon, May 23, Conley Resort. For info, call (724) 283-2222 or email Stan@ ButlerCountyChamber.com. Golf Outing Fundraiser for Elliott Acres Therapy Riding, 8 a.m. registration, 9 a.m. shotgun start, June 8, Hiland Golf Course. For info, call (724) 287-8814. North Hills Community Outreach Mini-Masters, 5 p.m., May 15, Robert Morris University’s Island Sports Center. For info, call Pam (412) 307-0069 or www.nhco.org/mini-mastersminiature-golf-tournament. St. Barnabas Charitable Golf Open, June 2. Choose from two field, 7:45 a.m. or 12:45 p.m., Butler Country Club. Celebrity golfer “Andy Russell.” For info, call (724) 625-3770 or StBarnabasGolf.com Youth Dragonboating, 6-8 p.m., Thurs., June 5-July 31, TRRA’s Millvale Boathouse, Three Rivers Rowing Association & Communities. RSVP by May 29. For details, call Judy, at (412) 366-3528 or Joy (412) 231-8772.
a.m., May 3 & 1 p.m., May 24; Stand-Up Comedy Camp On Stage, 7 p.m., May 3; Real Estate Seminar, 2 p.m., May 4; Book Sale Preview Night for Friends of the Library only, 6:30 p.m., May 9; Spring Book Sale, 10 a.m.-4:30 p.m., May 10 & 11; Olivia the Pig’s Adventure, 6:30 p.m., May 13; Zane Grey Presentation, 1 p.m., May 17; Shadows of Eve Free Concert, 2 p.m., May 18; Children’s Summer Reading Program & Magic Show, 7 p.m., May 30. Call (412) 486-0211. Andrew Bayne Memorial Library Centennial Celebration, located at 34 N. Balph Street. Celebration 100 years of serving Bellevue with an adult’s only party on May 16th, 6-8pm and a family get-together on May 17th 11am-3pm. For information, call (412) 766-7447, or visit http://www.baynelibrary.org/. Unfortunately, sprucing up the house sometimes has to start with maintenance first. My number one piece of advice is to clean out your gutters and do it routinely. Clogged gutters compromise roofing, siding, brick, foundations, etc., and can be very damaging. Check caulking around windows and doors, especially after this winter! Look for creative ways to divert ground water away from the house: landscaping, rock beds, yard drains or rain gardens. Turn your mulch over and distribute evenly with a rake. You may not need to add mulch every year. Mulch should be no deeper than 3 inches, especially around the foundation of your house. Paint your front door. So many people do not take advantage of this simple opportunity. Think outside the box: orange, eggplant, turquoise, cobalt blue or even black. A couple of outdoor planters with vibrant flowers together with your door can create a dramatic entrance. Starfish Rentals and Realty Inc.
Jaclyn Herring PhD – Licensed Psychologist at The Psychological Cooperative at Malec, Herring & Krause. Dr. Herring shares why she became a psychologist, “I wanted to be a psychologist from the time I saw The Bob Newhart Show on TV when I was a kid. His character was empathic, gentle and funny, but I have to say it was a little disconcerting that his clients never seemed to get better. So I chose a program of study rooted in research and measurement to be assured that I would know if people were getting better. Our profession can see people at the absolute lowest point in their lives. And we empower them with skills and insight and they get better. There are so many possibilities available in a career in psychology, from direct patient care working with people all through the age spectrum, to teaching to writing, to administration to developing new and exciting treatments.” Visit Jaclyn’s site at www. MalecHerringandKrause.com or www. DietLiberationCourse.com. Barbara Killmeyer Author of It’s Nobody’s Business but Yours explains why and how she became a writer, “I’ve always been an avid reader so I suppose that’s why I’ve always wanted to be a writer. I’ve always felt that writing something and having a lot of people read it would be the greatest thing that could happen to me. In addition, all through grade school and high school I enjoyed and did well in English classes so I guess I’ve always been preparing for a writing career without even realizing it. I wasn’t able to go to college right out of high school, but as an adult with a full time job as a secretary, a husband, and grown children I attended the University of Pittsburgh where I earned a degree in writing and one in psychology. It would have been so easy to just forget about a career in writing but I wanted it so badly that I just had to go after it. I’ve even written a book titled, It’s Nobody’s Business But Yours, which gives helpful advice to anyone who is either already in business or wants to start a business and make it grow and be successful”. Visit www.barbarakillmeyer.com to learn more or order a copy of her book. Jackie Sorrenti – Owner and founder of Gals on and Off The Green golf shops. Jackie shares that, “Since 2004, Gals on and off the Green has been helping women look and feel better about themselves, by providing a great selection of stylish golf and resort wear, world-class customer service and by offering fit, fashion and function for women of all shapes and sizes (sizes from zero to 22). We expanded our retail foot print by opening a new location in Chevy Chase, Md and Plano, Tx in 2013! We are very proud to be a “home town” brick and mortar retail expansion story. We also recently established our GALS Scholarship Foundation (where GALS stand for Growing, Achieving, Learning, Succeeding).The Foundation provides educational opportunities for women of all ages who participate in golf in some capacity (but you don’t have to be the best or most skilled golfer you can be a volunteer as a coach or have other involvement in golf). We are about women helping women – from fashion and sizing options – and now to educational opportunities…we are just going to keep pushing….because it matters…and we matter…one customer and one scholarship at a time.” Visit Jackie’s online store at www.galsonandoffthegreen.com. Donna Summers Moul - Certified Life Coach whose passion is to help women create their best lives. She offers Individual Coaching and Coaching Groups for Women. Donna explains, “There is nothing more rewarding to me than helping someone else improve their life. Throughout my career as a therapist, I have helped hundreds of women to learn to love and value themselves, create firm boundaries, say no without guilt and to find their voice to become assertive and live happier, healthier lives. More recently, as a LIfe Coach for Women, I help women own their strengths, reconnect to their values, rediscover their passions, and break through their barriers to create a purposeful, passionate and fulfilling life. Coaching is fun, it is challenging and it is effective. One women touched my heart recently when she said that “it’s the best thing I have ever done for myself.” My advice for anyone considering coaching as a career is to attend a really good program like the Professional Coach Certification Program at Duquesne University to get an excellent coaching foundation”. Check out Donna’s site at www. Especially-For-Women.com to learn more. As the president of Harmony Salon in Wexford, Pennsylvania, Harmony Kaiser has been committed to her mission of providing individual beauty for clients over the past 12 years. This passion for enhancing individual beauty has long been an integral part of Harmony’s personal and professional development. Since opening Harmony Salon at the age of 22 in 2004, she has become one of the North Hills’ premiere stylist and colorist. Her customer’s include some of the regions most notable business leaders, members of the media, and sports figures. Her commitment to customers, employees, and the community have allowed for several regional organizations to recognize Harmony as one of Pittsburgh’s “Rising Entrepreneurial Stars” in 2004 and 2006. In 2009 Harmony released the Mothers Milc line of natural hair care products, and also harmony products exclusively sold at harmony salon. To learn more about harmony salon go to www.harmonysalonpgh.com.